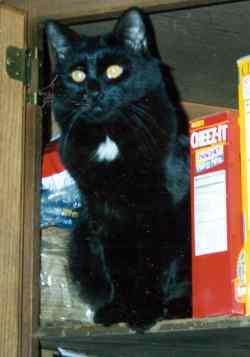 Munchkin was one of the many "Methuen Fire" cats rescued by Kitty Angels in July 1998. 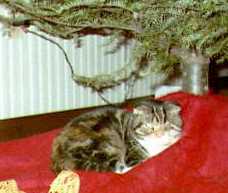 She was adopted by Bob & Deb in August 1998. No one is sure what happened to her left eye, but it proves to be no real handicap for her. She joins her brother Monroe, sister Carrie (Of Kitty Angels fame) and big sister Princess in playing, sleeping and sunning every day. Everyone who meets her falls in love with her and her Mom and Dad are very proud of her. 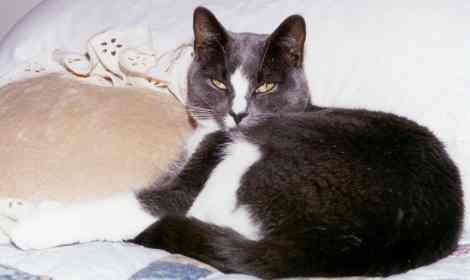 Mitzi (top) and Chloe (bottom) were adopted in the summer of 1997 by Lori and Carl, who tell us, "They get along together very well and are well adjusted to their new home. We are happy to have them!" Emmett was adopted in October 1998 by Joanne and Ken, who say that "he is a good old boy and we love him."